No wonder why more and more people are using WordPress for their websites. For one WordPress powers about 30% of the internet. It may not sound like a lot, however, considering that about half of the worlds’ population has access to the internet it really is a large amount. WordPress is an open source platform site builder. Open source means that anyone is able to create customization for WordPress such as plugins. It is especially useful for people that are not familiar with coding and want to create a professional looking website. What is involved in a WordPress website? When I say what’s involved in a WordPress site I mean just that! Some people ask me questions about the platform and they have the misconception that once they create the website that’s it the site will pretty much run itself. WELP! I’m here to tell you nooooo. If you’re looking to create a website with some interaction with others then you can’t just say let me make this website for my business and it’ll be over and done with. Now that is not how it works. You need to be able to make adjustments to your pages, you need to be able to update your plugins and your themes. You want to write fresh content frequently and engage with your readers. Maintenance on WordPress- and How much does it cost? The cost of maintaining a WordPress site is FREE if you do it yourself! But like most people, you may not have the time to learn the platform and write the content. Some of us just don’t have the patience to sit there for hours to write our own content or edit our own work. People don’t understand that there is a lot of things that go into creating a website. However, I don’t want to give you the impression that it’s impossible either because you literary can create a website in a few minutes. I think for me is more so like I want it to be perfect and at times I take way too long over thinking the process. Sometimes is a good thing and sometimes not so good. When I did my first website it was back in 2012 that was about 7 years ago. I did it for a class assignment nothing crazy. HELLO WORLD! :). My major was Information Technology. But then as I started thinking of what I really wanted to do in the IT field and ended up leaning more towards web designing. I had already a lot of knowledge in networking and because the IT field is so broad it’s easy to get carried away with what you want your title to be. It took me months to learn the WordPress platform so I want to make it as simple as possible to give everyone an opportunity to learn from me. I also created websites with Wix, and Square Space so I am familiar with those as well. There are many ways that this can be done because people have different teachings on how they create their own website. I am going to show you what I do to get started. First of all, I use the Wealthy Affiliate platform but you can use WordPress on any platform it’s the same thing I’m just going through a different portal. OK with that being said let’s get started! So step 1 you have to choose a domain name or a subdomain if you’re doing a free website. I host with WA because it’s cheaper for me, I have 5 websites that I’m working on and managing so I am able to do so all in one platform. Need more information on hosting click here. I talk about different hosting companies and my recommendations. Once you pick a name that you’re happy with for your site then you want to pick a theme. Make sure that you pick a theme that is related to the topic of your website. You don’t want to confuse anyone, also you want to pick something that you feel it’s easy to navigate so that your readers can identify topics that there looking for a lot faster. So as you can see below with my membership on WA I automatically get SiteSpeed and Spam Blocker included. I don’t have the option right now of Site SSL which stands for Secure Socket Layers because I am using a sub-domain. If I were using let’s say myonlinesuccess.com or any .com address then I would have the option of SSL. This is for training purposes and eventually, I will end up getting a domain name as the site progresses. SSL is a technology that establishes an encryption link between the server and the client. So when you’re accessing the internet and you need to put in sensitive information like your credit card, DOB, etc you won’t be exposed to hackers. NOTE: You can still have a professional website with a subdomain just don’t give any sensitive information like I stated. When I started dabbling with WordPress I noticed that if you want to customize your site you need to install what is called plugins. Plugins are software created by coders to extend the functionality and customization of your website. Some of them are free and others you would have to pay for. However, for the most part, plugins that you need are free. The plugins that I use are SEO, Contact form 7, Ewww image optimizer, MonsterInsight, and WP Socializer. You can install any plugins that you want it all depends on what you’re trying to accomplish on your site. Because I am not selling any products I won’t be installing any links to receive money such as Pay Pal. However, if you’re creating an e-commerce site then you will be needing that. NOTE: You do not want to add more than 5 plugins because it can lower the quality of your site by slowing down the upload and download speed. This can deter your readers from coming back because the site will lag will take forever to download. SEO helps your site get ranked higher on Google and other search engines such as Bing or Yahoo. SEO Pack is free to download, with the option to upgrade. But just to start with the basics so I am not to confusing you, and download the SEO pack. All the other extra stuff you don’t need right now. If you want more information on SEO Click Here to be redirected. A plugin that I also use is contact form 7 as a new page on my site. When I first started creating my website and adding content I didn’t have a contact me page but I have so many people asking me different things related to my website on a daily and on my comments that I decided to add a contact form for that purpose. The contact form 7 is completely customizable where you can request instead of the person’s email address you can ask for their phone number. You can change the colors schemes on it as well. When I first saw this plugin I was thinking why in the heck I need that! Well, let me tell you yall need it! It helps you resize your images to fit your device screen size. This helps with speed as well. Imagine you have a large image you installed on your WordPress site and someone is trying to view your site on their mobile device. It’s not going to look very nice if you have to move your screen around to read the content because your image is taking over your mobile screen. This is the primary function of this plugin. Monster Insight allows you to connect to Google Analytics so you can see how you’re gaining your traffic and from where. WP Socializer is a plugin that allows you to share your website on social media such as Facebook, Google, Linkin etc. Visitors that go on your site can also use the icons to share your story with others. In this step, you’re going to remove the default post and pages that are preinstalled in your WordPress. Make sure you do this for your post as well which will say Hello World! They are very similar but different, when you create a page it’s supposed to be static for example your about page, contact form etc. Those are examples of what a page is supposed to be on WP. When you create a post it’s supposed to be more engaging. it goes under your page if that makes sense? 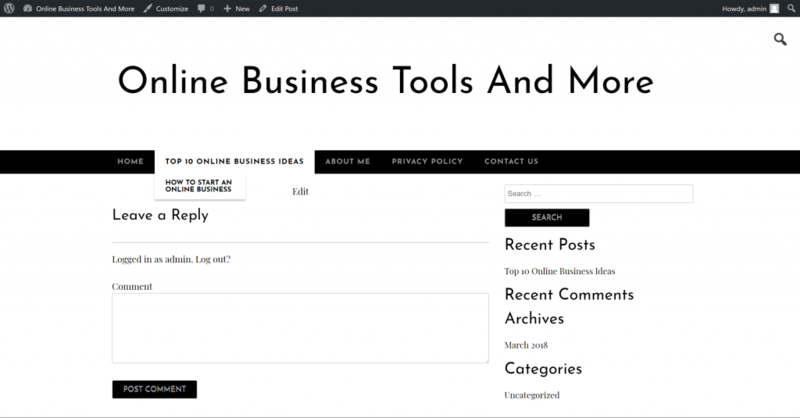 So if we write about Top 10 online business you use that as your page and as your post-AKA submenu, you can write something like how to start an online business. Makes sense? Go ahead create the menu, and name it Menu 1 like I did so you don’t get confused. Then what you want to do is check on what you want to bring over and change the menu around on the right with your mouse. It’s just a drag and drop. 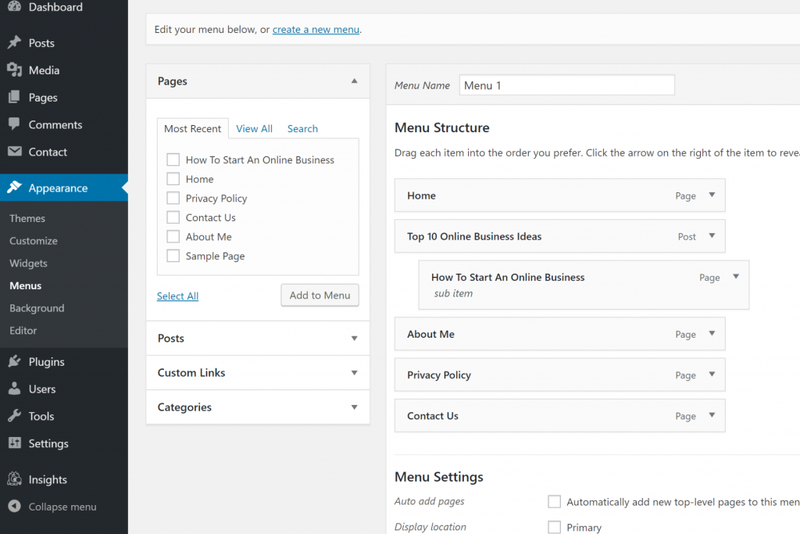 Once the menu is in order to your liking then go to your dashboard at the very top of your site where it says customize. Remember we saved our menu to Menu 1? Go ahead and choose that as your primary as so and you’re all set with your menu. Then go ahead and just delete it. You can put anything you want here but for this tutorial, I am going to leave it blank. OK, guys here is where you want to start giving the website of your personality because your website is going to reflect who you are. You have the foundation down but I still have more I will cover. in the following weeks so stay tuned. Whenever I start writing content for a website I usually do the about me first because I already know what I want to say, but you can start anywhere you like. Once you create your first content you always want to preview it before you save it to see if it’s something you want to keep or change. I hope that I have provided some valuable information for you to start your very own website. Although I may not have put all the answers for you here I want you to know if you have any questions and want to contact me directly please go to contact me or if you would like to leave a comment please leave one below. Remember today is going to be the new you! So get your mindset right and start your online business. Good luck on the new journey I hope to hear from you all. Want to start building your own website using WordPress? You have made having WordPress for a website look so easy and simple to use and I really thought that it was more difficult than what it was. The wp socializer plugin looks pretty useful and It is something I think that all websites should have, is it effective in people sharing your content? Interesting article as I wasn’t sure whether WordPress was one of the best programs to use. 30% of the market is huge so they must be reputable. Great information. You are very right about having to put in work with your website. I daily check mine for comments & updates. If you don’t your site will seem stagnant and I don’t think Google would like your site very much. You have a lot to do when you start one so be ready to put the groundwork in if you want it to have a chance. I love how you showed what to expect. Wow, this is such a comprehensive guide I can’t thank you enough. I’ve owned a blog for a few months now but haven’t used the SEO plugin you mention, so I’ll be downloading and installing that on my site and see how I go. I’ll be trying out Socializer too because I want more and more shares. Thanks for all this info! I don’t know what we would do without WordPress but I’m sure glad it’s available. I love WordPress & what it has to offer. Is there a social media plugin that’s better than the other or is it a matter of personal preference? Thank you so much for writing & sharing this valuable information about WordPress. Nice! You hit the nail on the head. You just can’t put up site and not be on everyday taking of all kinds of things. Really nice post and full of value. Having spent several years blogging at Google Blogspot I’m finding the transition to WordPress to be challenging. Thanks for all this info. You make this look so easy. I remember having a hard time when I started off with my two free websites. I found it so hard to get things done, and I had this misconception that I could only add plugins to a domain and not a subdomain. If I may ask, is it possible for me to create a “baby” theme (using siterubix dot com) to test some plugins before using them on my main website (domain)? I’m not sure whether this is a completely different concept. My apologies if I’m wrong. Hi Princila no you asked the right question. This website use to be a site.rubix as I was testing out the different plugins, then the more I worked on it the more I was committed into making it look better with adding some valuable information that I learned. It was about 1 month ago when I purchased a domain for it. That’s the best part that you can try it out as a free site and if you end up liking your concept then you can purchase a domain name or start over with a new site. I did that a few times when I first started dabbling with WordPress about 2 years ago. I learned that as I went along, to purchase the domain after, but everyone different. Before I would end up purchasing a domain name for it and had to start all over and exporting was like something out of this world. I hope that this answered helped you. next post) I’m sure to be up and running in no time!